Accurately dating vintage clothing is like one giant puzzle because you need to gather as many of the pieces as possible before you can confidently draw a conclusion as to what that puzzle really looks like. I wrote about eight easy ways to identify your garment as vintage, which helped you to recognize whether that great maxi dress you thrifted was actually from the ’70s or was just a 2012 lookalike. 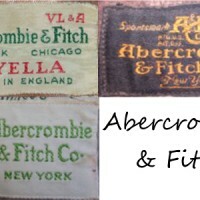 Speaking of thrifting, I’ve also shared clues on how to identify vintage clothing labels in a thrift store and I’ve explained 11 ways to know a piece is vintage by its labels and tags and how the ILGWU union label can help you to date a garment’s era, too. 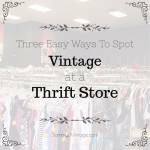 Did you learn something today or have a vintage garment you need help dating? Let me know in the comments below the post, or by saying hello on Twitter, Facebook, Instagram or by subscribing to my newsletter! DATING TIP: Identify whether the buttons are bakelite plastic, lucite plastic or modern plastic. 1930s-1940s: Bakelite buttons are plastic buttons found on 1930s and 1940s garments. Bakelite was invented in 1909 as the first ever synthetic plastic. You know a button is bakelite plastic versus a more modern synthetic plastic because it’s almost always colored. Test a button’s bakelite authenticity by spraying a Q-tip with 409 cleaner and rubbing it against the button. If the swap has yellow stains, then it’s bakelite. 1950s: If the button is clear, you’re most likely looking at lucite, a transparent type of plastic invented in 1931. 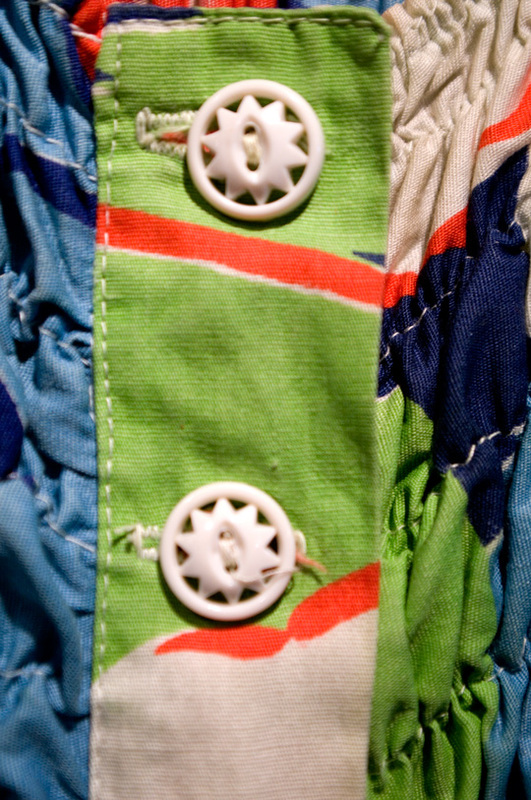 Lucite buttons were most popular on garments of the ’50s. DATING TIP: Identify whether the garment has a zipper and if so, where the zipper is placed and if it’s metal or plastic. 1920s: Zippers were invented in the late 1800s but weren’t used in clothing until the 1920s, and only in men’s trousers and children’s clothing because they were considered vulgar for women to wear! Reason being that a zipper made it too easy to take one’s clothes off, thus only “easy” women would ever want to wear a garment with one! 1930s: The infamous zipper is rarely seen on garments. 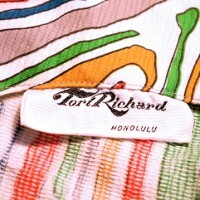 When included, a flap of fabric conceals this “vulgar” detail. 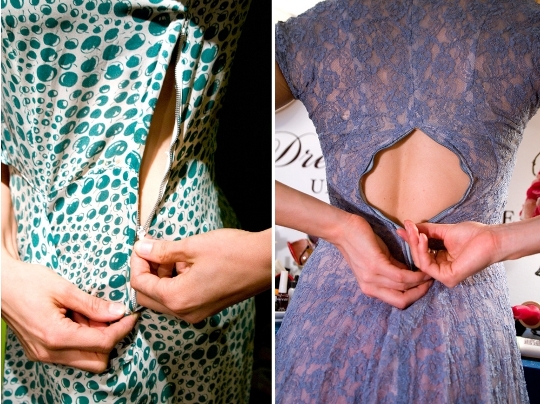 A zipper in the ’30s would most likely be found along the side seam and is always metal. 1940s: The zipper is accepted in women’s clothing, horray! Zippers (always metal) are most often found along the side seam. 1950s: Metal zippers are more accepted than ever in lady’s garments, and their predominant placement shifts from side seam to back and center middle seam (some dresses still zip along the side seam, however). 1960s: The zipper is now almost always a center back placement. Metal zippers begin to be replaced after 1963 with the invention of nylon, which introduces the plastic zipper. 1970s – TODAY: Plastic zippers found along the center back of a garment officially reign supreme — and are what we’re left with today! 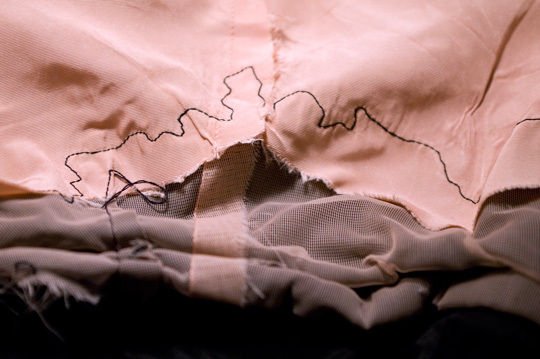 DATING TIP: Identify whether the garment has frenched, pinked or serged seams. 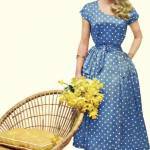 PRE-1940s: French seams were used on turn of the century clothing through the 1940s. French seams are the neatest finish of seams, as the raw edges of the fabric are fully enclosed for clean lines. 1950s: Pinked seams — which look like scalloped teeth — are most common on garments from the ’50s because it was the easiest way to cut a seam without leaving fraying behind. While “pinking cutters” were patented in 1893, it was the invention of the pinking “shears” (essentially scissors) by Benjamin Luscalzo in 1952 that popularized this seam style. 1960s: Serged seams replace the pinked seam in the 1960s. 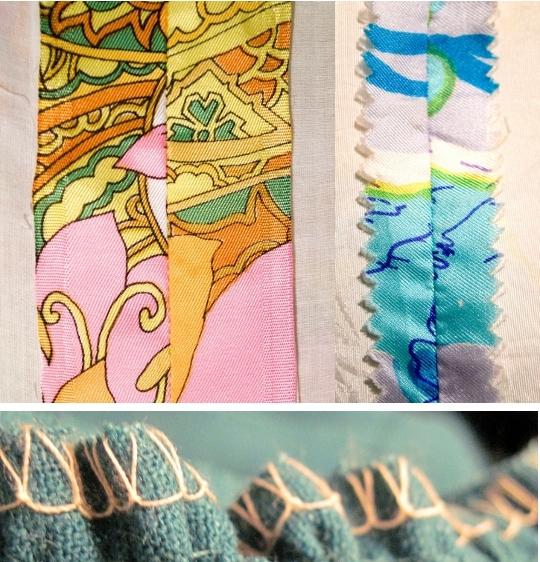 Serged seams are an overlock stitch that strongly secures the fabric and leaves a zig-zag like pattern behind. While the serged seam had been around since the early 1900s, the serger machine became more affordable for at-home dressmakers in the ’60s, thus women adopted the serged seam to leave behind a clean, crisp finish to their work. 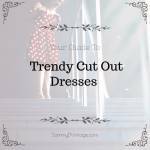 UNFINISHED SEAMS: If the piece has unfinished, frayed seams there’s a good chance it was made before the ’50s since both pinking shears and serger machines weren’t available to at-home seamstresses. 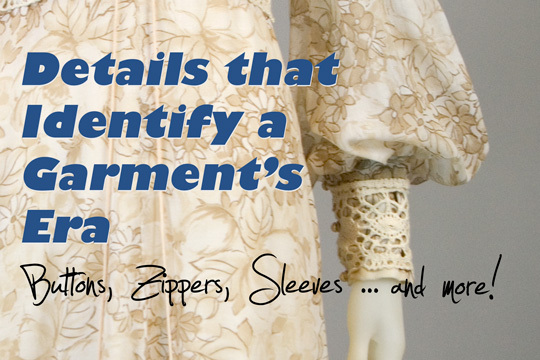 DATING TIP: Identify whether a garment has tailored sleeves or large, billowy sleeves. 1960s & EARLIER: Before the ’70s, sleeves were tailored to the wearer’s arm. The spacing between the fabric and arm was equidistant along all points of the sleeve. 1970s & EARLIER: Armholes of the ’70s and earlier were small openings, unlike the oversize “muscle man” armholes you might notice in a lot of ’80s garments. 1970s ONWARD: Once the ’70s hit, styles shifted to embracing the space between a woman’s skin and her sleeve. Bishop sleeves (shown above) were a popular style of the quintessential ’70s Edwardian style maxi dress. 1980s: Batwing, dolman and puff shoulder sleeves were all the rage in the ’80s. No more was a lady just to wear a simple sleeve! DATING TIP: Identify whether a garment has lining or not. NO LINING: Garments prior to the ’70s were often made without lining because a woman’s slip would operate as the lining instead. Because a woman was expected to wear a slip, her dress didn’t need to be finished with lining to prevent the raw seams and stitching from brushing against her skin. LINING: A dress with lining is possibly from the 1970s or later, however there is an important exception to note. Women in the ’70s often didn’t wear a slip because the styles of the era were less body conscious and made from cotton or polyester material (no Mad Men wiggle dresses here!) and therefore didn’t require a slip to conceal and smooth lines. 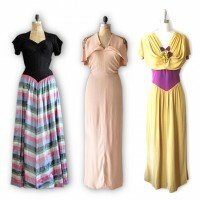 Manufacturing dresses with lining became more popular beginning in the 1980s, when styles reverted back to the form-fitting and body conscious. 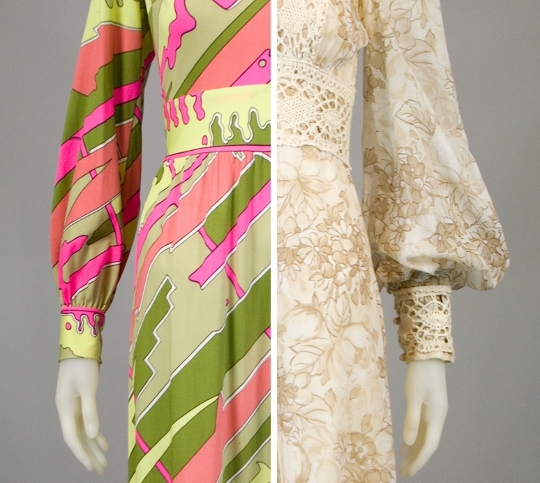 ’60s VERSUS ’70s: To differentiate between non-lined dresses of the ’70s and ’60s, note the material first. If the dress is polyester, you’re most likely looking at a ’70s piece. Natalie, let me know what those mysteries are and what you SOLVE. Nancy Drew! yes! Ahhh, more informational tips. You’re making us all smarter! Thanks, Sammy! I’ve been lurking for awhile and you have answered a lot of questions for me. Thank You! Now to the biggy!! I have been racking my brain since Friday when I got this. I bought a gorgeous hat at an estate sale. It’s a “Original Roberta Bernays” hat. The union label has NO pin going through the back ground of the union stamp, which if I have read right mean’s that it was before 1950? The union label is black and white and the letters and numbers are GI 304744. How can I tell? Lisa, I apologize for this late response! Thank You So Much!! Sometimes you walk in to an Estate Sale and you almost start hyperventilating from all of the lovely treasures your seeing when you walk through the front door. 1) it can be tricky to date garments by buttons because often they are changed or harvested off over time. 3) Thanks to Schiaparelli, metal zippers were put to creative use on many 1930s dresses. I collect 30s clothing and have seen zips on sleeves and have a garment in my shop right now with zippers on the shoulders! 4) Your section about pre 1960s sleeves is, unfortunately, inaccurate. Bishop, juliet, batwing, dolman sleeves all were put to use well before the era you indicate. 5) ALL the store-bought 1930s dresses I own have serged inner side seams. Some are deadstock, so I know this was not something done later! 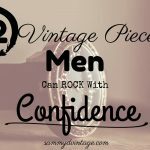 6) Your section about pre 1970s linings does not reflect what we see in many jackets and suits from earlier eras….when discussing vintage, we shouldn’t just look at the dresses of the era. Thanks for your time. I appreciate your efforts but just wanted to clarify that my experience, observations, and research reflect some different findings. 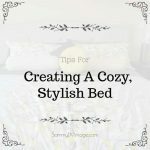 Some great tips – but it’s important to note that your comments about interior seam finishing only really applies to HOME SEWN items – not custom or manufactured items. Although women in previous decades most certainly made their own clothing much more often than today, the vast majority of items were still purchased, not home sewn. I agree with Jill. There are a number of inaccuracies and misleading statements here. Please do ammend the post. I would also add that concurrent with bakelite buttons in the deco era were buttons in other kinds of plastic. Celluloid buttons were still made. And the kind of cheap light plastic that I believe you suggest is later than the bakelite period also already existed in the 30s/40s. I have a lot of intact cards of buttons from those decades in that kind of plastic. I also have jewely from the 30s/40s in that kind of plastic, which was widely used. My intentions are good in pointing these things out, and by all means, I know your intentions were good as well. 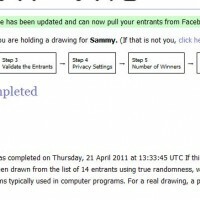 Hey Sammy, thanks for all the tips. I’ve been learning a ton from this site and today I found a 1970s velvet blazer with the union tag for 1.99 at Goodwill. It’s by Koret, in mint condition, and fits like a glove! Thanks! Hey Brittany! This is SUCH great news! Oh my gosh, where do you live with such fabulous Goodwill deals?! Great article! In fact, I’ve been combing your archives. I have an odd little late 30s number which I think has been heavily altered in the past, probably by a theater . . . And I’ve been trying to date it more exactly. I know other people have mentioned this, but your French seam image isn’t a French seam. There’s no way to press a French seam open like that. You’re right that French seams can be a great way to date clothes, I’d hate for people to have the wrong image in their heads! Also, you should note that even current clothing may have French seams if the material is very fine or transparent. Anyway, I was wondering if you’ve come across pieces which have a manufacturers label and unfinished seams? From the cut I’d say it’s late 30s or early 40s. It’s a plus size, lightweight cotton print. The armscye is overlocked, but nothing else is. The side seams are downright bizarre- a normal seam with another line of straight stitching bout a quarter inch from the edge of the seam. Like an inside out French seam, almost! Any comments you have would be appreciated! Thanks! How did you find a way to develop this type of wonderful audience associated with commenters to your web page? I have a pair of Jackson Junior boy’s blue and white striped coveralls with a flap in the back. They would probably be about an 18 month size. The buttons are all metal and say JACKSON JUNIOR. I am pretty sure they were made in the 50’s according to the person that I bought them from. I can send a picture if you would like. They are in extremely good condition. I would like to get some sense of what they are worth.